Moment Pro is now across both photo and *video* including RAW and full manual controls to easily adjust exposure, ISO, shutter speed, focus, white balance, image format, and key ingredients in great mobile filmmaking like color profiles, bitrates, waveforms, RGB histograms and now both PAL and NTSC frame rates. 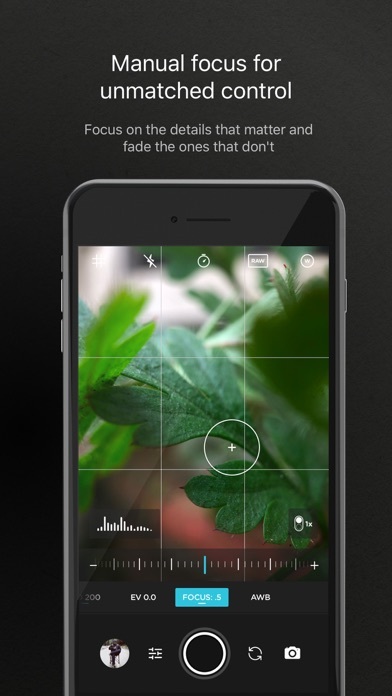 Moment Pro Camera - DSLR camera controls, now on your phone. Free to download and try. 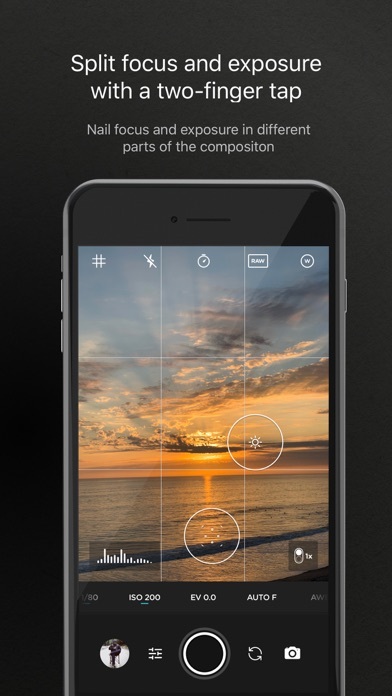 $4.99 to unlock professional photo and (New!) advanced video features. Photographers - shoot in RAW with full manual controls to easily adjust exposure, ISO, shutter speed, focus, white balance, and image format. Now you can control the details you’re used on a dslr camera. Filmmakers - you get all the manual controls above plus color profiles, bitrates, waveform, RGB historgram, and both PAL and NTSC frame rates. 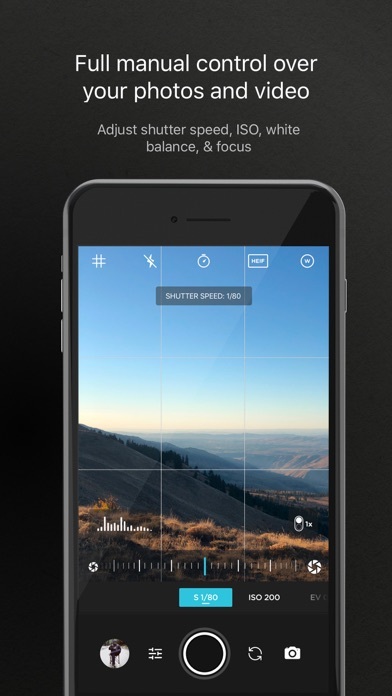 Free enables you to shoot, split focus/exposure, and manually adjust exposure. 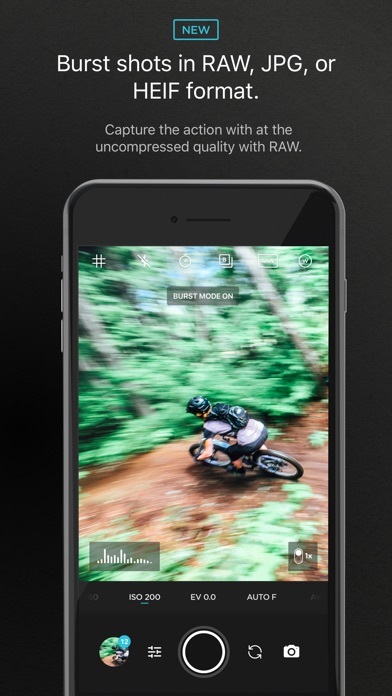 ---Free features include--- + NEW: Burst mode - Capture burst shots in JPG or HEIF format. 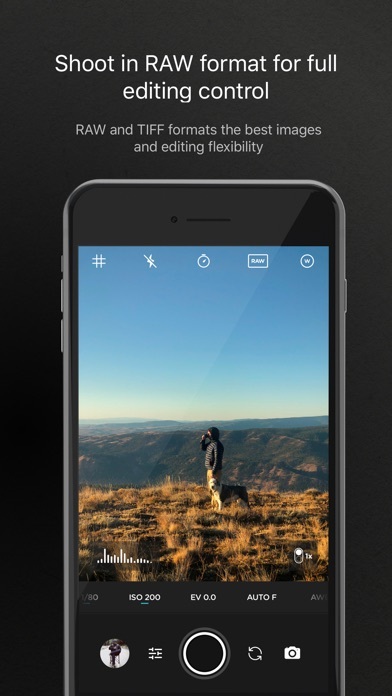 + Anamorphic - Use the Moment Anamorphic lens to shoot amazing, letterbox style photos and videos. + Apple Watch - Use your watch as a remote to shoot photos or record videos. + Split Focus and Exposure - Take control of tricky lighting scenarios. + Exposure control - Get just the right shot with a broad range of real-time exposure compensation. + HEIF and HEVC - Seamless support for the latest Apple file formats across photos and videos. + Chose PAL or NTSC video frame rates + Live Histogram - Get your exposure right every time. + Auto Video Stabilization - Make your videos buttery smooth. 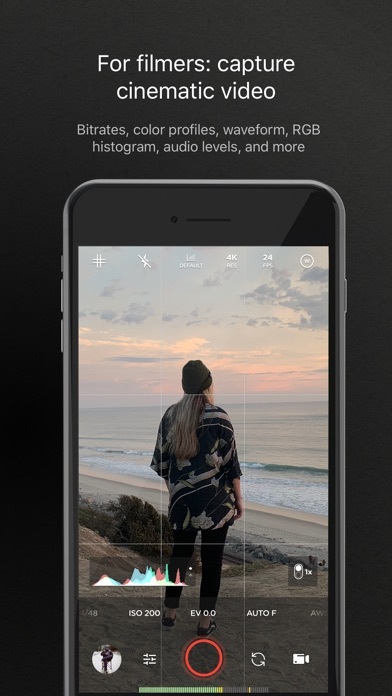 + Moment Lens - select which lens you are shooting with. + Siri Shortcuts - Quick access to capture a photo or start a video + Dual Lens Control - Manually control which side of the dual lens you want to shoot with so you can use Moment lenses over either one. ---Pro Upgrade Features--- + NEW: Burst mode - Capture burst shots in RAW format. This is big as now you can capture action with burst but at the uncompressed quality pros want with RAW. + RAW and TIFF - Shoot photos in RAW format for better editing, or TIFF for high-quality printing. * + Full Manual - Control ISO, shutter speed, focus, and white balance independently with easy to use sliders and double taps to reset. 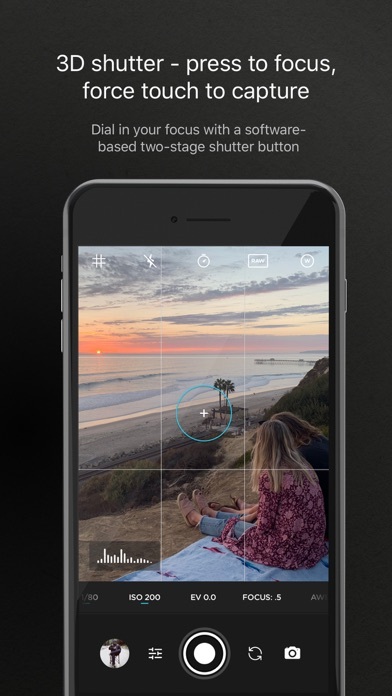 + 3D Touch Shutter - Control your shutter like a DSLR camera. Using Apple’s 3D Touch technology, we’ve brought the shooting experience of a pro shutter button to the touch screen. Half press to focus, full press to capture using the in-app shutter button. * + Precise Video - Change your resolution and frame rate on screen, without digging into a settings menu. + Video Color Profiles - Select from default, flat, or log color profiles to get the most out of your files in post-processing. + Multiple Video Bitrates - Get precise control over video quality with standard, medium, and high bitrates to choose from. + RGB Histogram: Dial in your video color, balance, and exposure with a live RGB histogram. 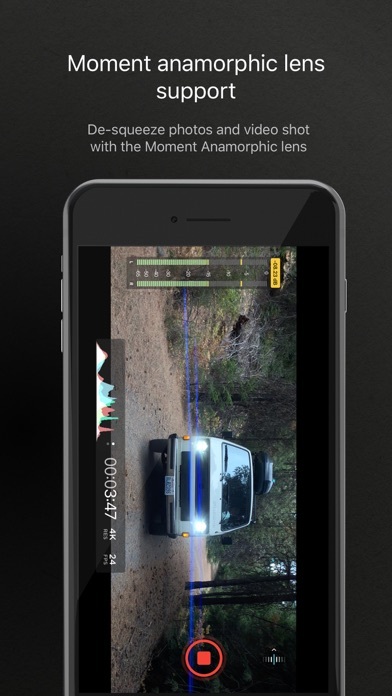 + Waveform monitor - Evaluate video brightness and exposure across your image in real time. + Dual-channel audio meters - Get just the right sound levels with real-time, precise, dual-channel (when available) audio levels. + Even better a Moment Photo Case - Works with the DSLR-like shutter button on our photography cases for half-press and full-press capture. Take better photos, faster. 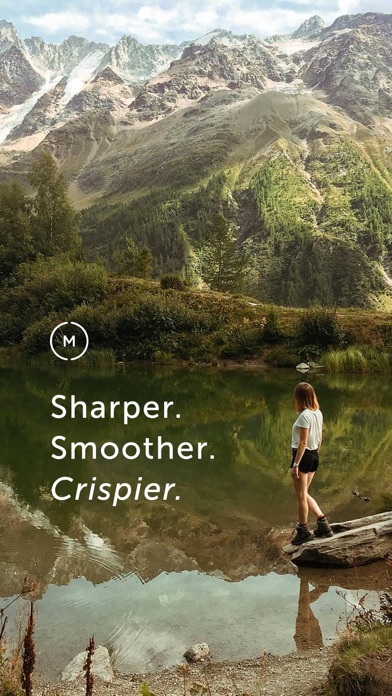 * RAW and 3D shutter require an iPhone 6S or later (6S, 7, 8, X, XS, XR, SE) ----- We love hearing from you. If you have any features, ideas, or feedback please email us at hello@shopmoment.com or DM us on Instagram @moment. The app was perfect till it’s recent updates. So now when you’re taking a photo in Raw mode, the preview in Raw camera mode is not how the actual final photo looks. It actually is darker than how the photo or frame was looking, when taking the shot. So when you open up the photo in an editor, it shows up darker & less exposed than how you thought it looked when you fixed the settings already when taking the photo. This also affects the white areas, highlights & more exposed areas now. Because now when I try to fix the exposure, brightness on one area of the photo; the white areas, bright areas & highlights gets blown off or over exposed. So its not balancing out & thus have to swithc to TIFF mode which I only used when using the anamorphic lens, but now will have to use it all the time. I mean one of the purposes of a camera app is to help me show how the framing & photo will be looking when my settings are locked down. Not show me a developed photo will taking the photograph & then show me the original, less exposed photograph in editing which now will need more work on editing since now I not only do have to edit it to get the looks I want but also fix & balance exposure, brightness & contrast first all over the image. Thus, from 5 star experience I am switching to 3 star. THE CASING FOR ALL BRAND IS FAILING NOT SUITABLE FOR THE ADVENTUROUS TYPE LIKE THEY WANT!! I have moments for my iphonex and after rigorous use for my island hopping trip in the Philippines and street photography in Tokyo the casing just give out. What I get now is that this company make sturdy and really good lens but the casing needs improvement. The casing is heavy and you made a easy release but not a durable plastic. you could’ve made it with durable light metal or something like aluminum so i won’t fall off the lens. You want your buyer to go on adventures but the casing is not durable enough to withstand your flagship. I would like to recommend this product but the casing needs a whole lot of improvement. The app alone helps my photos ... great work 👌🏾 gotta get lens next ... to be continued. Get this app, you’ll love it. Just a couple of issues: 1. The controls are always visible with no button to hide them. The darkened overlay panels make composition difficult, especially on sunny days with the anamorphic lens. You should be able to hide the controls, except maybe leave the histogram and EV compensation there w/o the darkened panels. 2. Sometimes pressing a volume button as the shutter doesn’t take a photo. App was updated and working again. Testing out the new features. So far I like it. The app was great until the last update which rendered it unusable. The latest update is borked. All I see is black, and other than getting into the setting, the app consistently crashes.